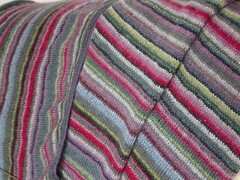 Mystical Stripe is taking shape after languishing in the work basket for too long. Two sleeves and half the back are done. Here it is finished. If you look at my categories on the right hand side of the blog you can see other entries on this project by clicking on the link.